Whether an individual has traditional braces or uses Invisalign® liners for straightening the teeth, daily brushing and flossing are important aspects of proper oral hygiene. Therapeutic mouthwash is also beneficial for the teeth and gums. A toothbrush is ideal for removing debris and bacterial plaque from the front and back of the teeth; however, the plaque that forms along the sides of the teeth and under the archwire of traditional braces must also be removed. A toothbrush is ineffective in removing plaque from these areas. 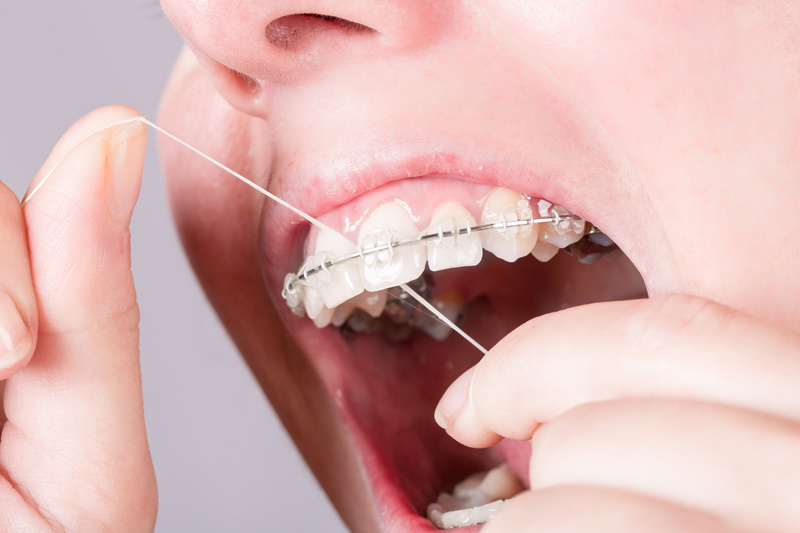 Therefore, the Academy of General Dentistry (AGD) states that regular flossing is also an essential aspect of maintaining oral health for individuals with and without braces. Flossing regularly removes the plaque that forms between the teeth and beneath the gums before it can harden and turn into tartar. Floss is available in waxed and unwaxed versions of a thin string or tape form. Individuals who wear Invisalign® and find it difficult to floss should consider trying the flossers that have a plastic handle already attached. This style of floss is easier for many people to use. Individuals who have traditional braces can make cleaning in between their teeth and under their archwires easier with oral irrigators or flossing products (i.e., floss threaders) that are specifically designed to assist with threading dental floss through the brackets. Floss picks are also very helpful for individuals with braces. These picks have a section of floss held by prongs that are frequently thin enough to slide under the wire. On the opposite end, are bristled picks for cleaning the brackets. Therapeutic mouthwashes/oral rinses contain a variety of ingredients, including antimicrobial agents and fluoride. Therapeutic mouthwashes and oral rinses can remove plaque buildup; thus, potentially reducing the formation of tartar. Furthermore, therapeutic rinses can assist with the prevention of cavities and periodontal diseases like gingivitis. For the convenience of our patients, we have five locations throughout Central Florida. If you want to learn more about the orthodontic procedures available at DeDomenico Orthodontics, please contact us today at 813.961.1313. We look forward to seeing you smile!